There's something about Spring that makes you want to get things off your to-do list, isn't there?? I've been more productive today than I have in a single day in quite some time! 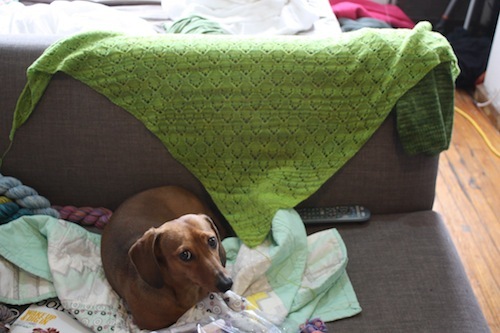 The picture above was supposed to be of the shawl, but when I look at it I can't help but focusing on sweet Arnold who's making such a cute face! But really, the point of the picture is that I finished the lace shawl. And I'm very happy with how it came out! Now that the weather is warmer a light laceweight shawl is the perfect accessory. I always knit shawls in the summertime because they're season-less and aren't too warm to keep on your lap when you're working on them! I don't know what I'm going to name this design yet . . . but I'm aiming to have that pattern done and ready for you guys by the end of next week, so I'll have to decide soon. Also done today: a big kit order for Loop! 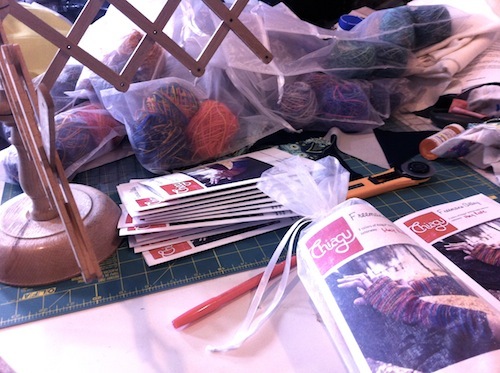 That's right, I now have two brick-and-mortar retailers stocking Chiagu kits. It's so so exciting! It's actually less of a disaster than it was this morning before I cleaned up the apartment . . .
And speaking of apartment and getting things done, I'll be moving out of this tiny studio at the end of my lease, which is at the end of April. That means I'm already looking at all my stuff with a critical eye and trying to clear things out so they don't have to be lugged down 5 flights of stairs to get out of here. There may or may not be a stash sale coming soon . . .
Oh and speaking of sale, did you notice that I now have a sale section in the shop? Right now there are Freemans Alley Kits in there on clearance for only $12, because I'm discontinuing the old put-up and will be re-releasing the kits with more yarn in them (the ones that I've made for Loop are the new put up). What's the difference, you ask? Well the ones on sale now only have enough yarn in them for a size Small or Medium pair of mitts. They have exactly 1 skein's worth of yarn in them. The new kits will have 1.5 skeins' worth, so there will be enough for even the Large size mitts. So if you'd be making the Small or Medium anyway, you might want to snap up one (or more!) of the remaining clearance kits!